Black is a chic wedding color in any season. It provides a flattering contrast for light shades such as white or blush; makes bright hues like orange or green totally pop; and pairs famously with metallics. Sparkling silver accessories and glittering gold statement pieces both look fantastic with a LBD! Whether you’re shopping for your bridesmaids or rocking a black gown yourself, these fun and formal accessories will turn heads. Enrich your hair with a glorious array of gilded leaves. 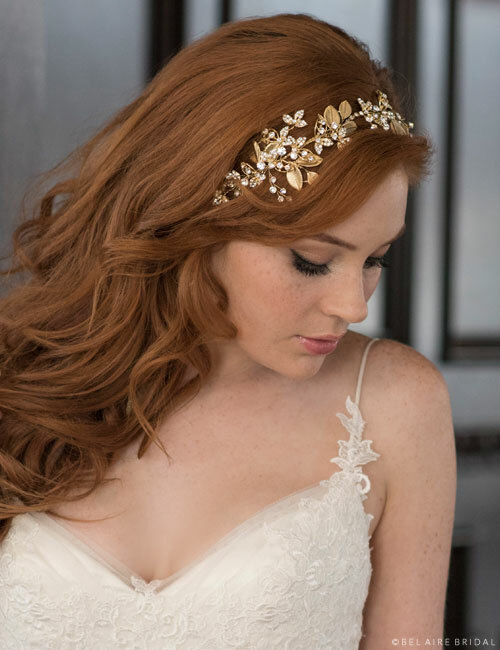 Style 6676 is a tie headband featuring gold leaves and sparkling rhinestone accents. Totally opulent, this goddess-worthy item beautifully mirrors nature’s autumnal bliss. Style it with an ethereal gown for maximum impact. Shine on, you crazy diamond! Style 6611 is a gorgeous headband encrusted with glittering rhinestones. Add glamorous sparkle to your ensemble by pairing it with twinkling jewelry and a stunning veil. Create an ensemble worthy of a princess for your big day—you’re worth it! Add that extra something to your bridal party’s wardrobe. Style BT072 features round and marquise rhinestones in a narrow, linked design finished with ribbon ties. Sparkling with opulent beauty, this unique design is available in either silver or gold to match other accessories. 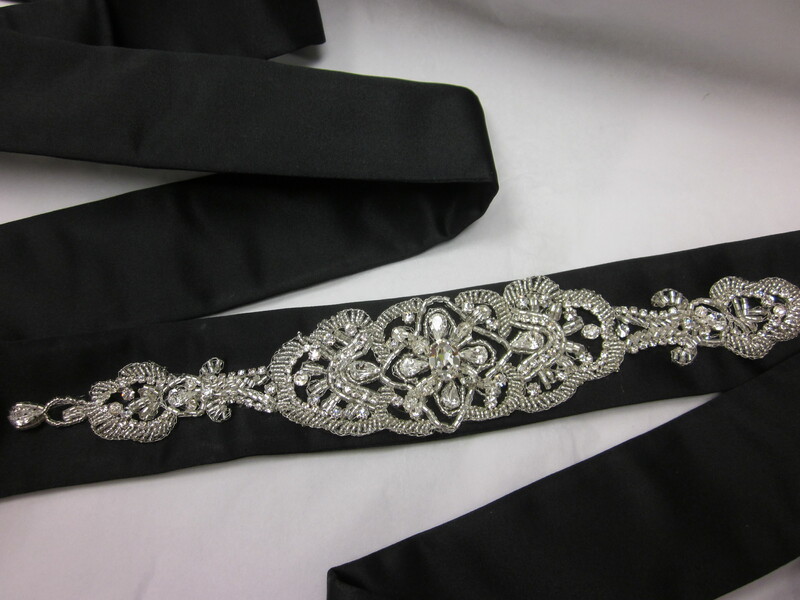 Embellish any formal black gown with our gorgeous belt style BT010. 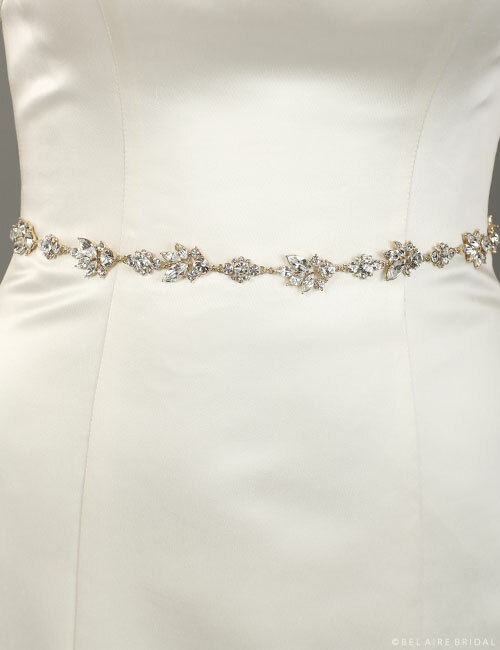 Available in black, diamond white, ivory, or white, this beautifully beaded masterpiece features a silver design glittering with rhinestones on a wide satin sash. This otherworldly accent is perfect for the elegant bride. Bedazzle your wrists with a lovely bit of classic bling. Style BC134 is available in gold or silver and features square stones surrounded by halos. Add a touch of charm to your bridal look and enjoy wearing this sparkling accessory for anniversaries to come. Style a crush-worthy vintage look with your LBD. Style BC145 adds Art Deco style and sparkly pizazz to any ensemble. Available in gold or silver, this lovely design completes your edgy theme with swanky opulence. Pair it up with a headwrap or dazzling earrings to finish off your look. For an enchantingly gorgeous look, style EA232 features pear-shaped rhinestones in a dazzlingly decadent design. Choose sparking, sunny yellow gold or shimmering, moonlit silver for your ceremony and reception. Equally perfect with a LBD or elegant gown, these sleek drops add pure glamour. Create a look of timeless beauty and romantic allure. 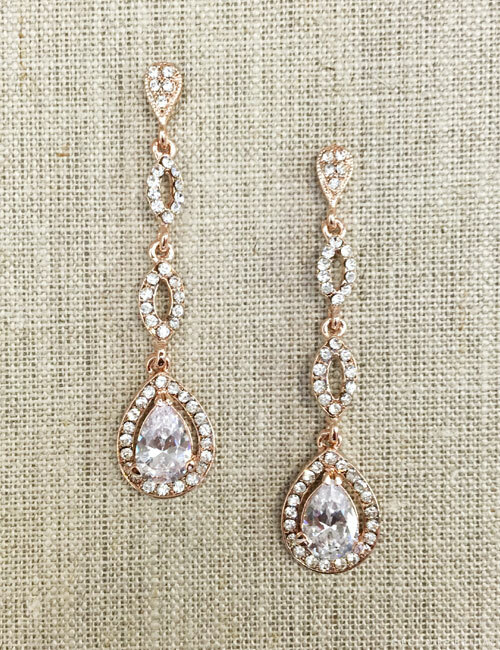 Pretty floral drop earrings EA204 feature vintage-inspired filigree and sparkling, pear-shaped rhinestone drops. Show off exquisite style by adding a twinkly bracelet or metallic halo for your hair. How are you dressing up your LBD? Follow us on Instagram for styling ideas!